SYDNEY, N.S. 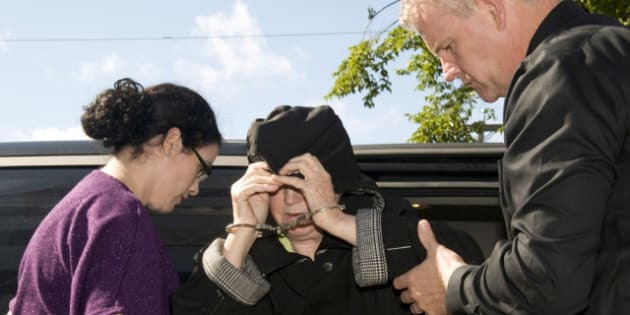 - A 77-year-old woman who killed her previous spouse two decades ago and gained notoriety as the "Black Widow" was charged Tuesday with attempted murder after her husband fell ill while the couple stayed at a Cape Breton inn. Melissa Ann Weeks was led into Sydney provincial court Tuesday in handcuffs with a black-hooded jacket pulled over her head as she was arraigned on charges of attempted murder and administering a noxious substance. The New Glasgow, N.S., woman was remanded into custody until Friday for a bail hearing. Her 75-year-old husband had to be taken to a local hospital when he became suddenly ill on the weekend. Cheryl Chambers, the operator of the Chamber's Guest House Bed and Breakfast in North Sydney where the two were staying, said the couple checked in early Friday morning. Chambers said Weeks told her the pair had travelled to Cape Breton from Newfoundland and that her husband was not feeling well due to a rough ferry crossing. Chambers said Weeks came downstairs alone on Saturday morning and said her husband wasn't well, leading Chambers to call paramedics who took her husband to a hospital. He has since been released. An entry in the inn's guest book reads, "Fred and Millee Weeks — We enjoyed a wonderful stay. Thanks for everything!" Desiree Vassallo, a spokeswoman with the Cape Breton Regional Police, said officers launched an investigation after doctors became suspicious of the man's condition. Police were dispatched to Weeks' home Monday where they arrested her, at which point they became aware of her previous convictions, Vassallo said. Vassallo said she couldn't reveal any details about the substance that was allegedly administered since the matter is still under investigation. "We can only speak directly to the case and the charges we're dealing with," Vassallo said. "But we do believe this woman has gone by other names in the past and does have other similar criminal records." Weeks has a lengthy criminal record that includes convictions for manslaughter, theft and forgery. She was convicted of manslaughter in the death of her husband, Gordon Stewart, who she had drugged and run over twice with a car in 1991 outside Halifax. She served two years of a six-year sentence for that crime. Weeks was also sentenced in 2005 to five years in prison on seven counts of theft from Alexander Strategos, a man in Florida she had met online. Investigators in that case said she stole about US$20,000 from him. Reached at his home in Florida on Tuesday, the 81-year-old Strategos said he wasn't that moved by the latest charges. "It's no big deal for me," he said in an interview. "She's the one who's in trouble, not me." Strategos said he met Weeks through an online dating site and that she stayed with him for about a month after he invited her for a visit in 2004. Florida police and his family originally accused Weeks of drugging Strategos after he fell down and was sent to hospital seven or eight times, feeling weak and ill. In the end, police said there wasn't enough evidence to lay charges. "I was very lonely and she was willing to come down," he said. "We had dinner and that's when I asked her to stay with me." Over the years, Weeks has been dubbed in some media reports as the "Black Widow" or the "Internet Black Widow." One resident at the New Glasgow apartment complex where the Weeks were living said their relationship appeared to become serious quickly after they met. Pauline Chapman said she had spoken with Melissa Weeks a few times since she moved into the complex about a year ago and that Fred Weeks hadn't been living there as long. Chapman said she was surprised to learn the couple had married following what she thought was a brief courtship. "It was a quick relationship. I was away for a couple days and I come home and I heard they had married," she said. "She always went to Christian fellowship and she wanted to pursue a relationship with me and I just kind of backed off." The Crown said it will oppose Weeks's release during her bail hearing Friday.